Happy Monday everyone! I hope you all had an excellent weekend! I tried, but I was still pretty sick. :( One day, I'll stop whining about this! I have a couple cards to share with you today. The first is a card I made for the All Things Unity challenge. I used to be on this team and they have the BEST most fun challenges! You should go join in! the current challenge is a sketch and it's very fun! 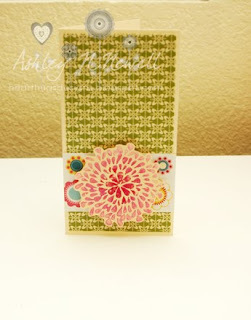 I used some Bella Blvd All Inclusive for this card, all the patterned paper if from that line. And the stamps are from Ippity's Fishy Philosophy set. I think this sentiment is just so cute! I love Finding Nemo! I popped the fishy up to give him some dimension. I'm also entering this one in the Moxie Fab World fun and cute challenge because seriously dots and fish? What's cuter? The next card I made is with the current Card Positioning Systems sketch. It's super clean and simple and to tell you the truth, I had issues with it. I don't know why. But this is what I ended up with. I used Ippity's Now and Always kit for this one. I tried working in a sentiment but I just couldn't make it work. The paper is from Bella Blvd Plastino. I tried to do a different effect on this stamped flower. I used my Creative Inspirations Paint for this. I applied the paint directly to the stamp. I think I'll do a tutorial on this later this week. The colors I used are Tutu Pink, Tickled Pink and Fuchsia. Have a great day everyone! And don't forget to check the Ippity blog to see all the people participating in this week's hop! 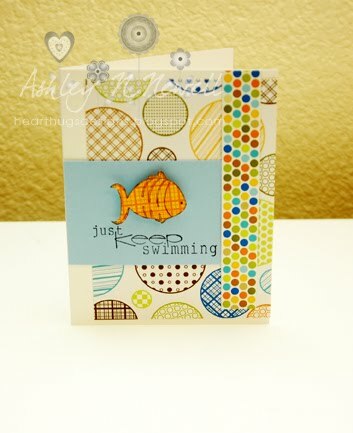 The fish on your first card is so cute and I just love what you did with the CPS sketch too. Your cards are so cute. Love how you used the stamps and that dp is sweet. Great cards! Love those colors! TFS! Super cute Ashley- I love that fish! Love both the cards and all those dots on the fishy card! Beautiful as always Ashley! Yes! The fish and the polka dots are adorable! I love seeing projects with this set, I have it and i love it, but it stumps me! the flower card is really pretty, I think sometimes the cards don't need a sentiment..and you can use them for anything! Sometimes I think it makes a card look more elegant. PS: Iwould love for you to share that technique! Love your cards, that All Inclusive DP is perfect with the fishy philosophy stamp and I would LOVE to see a tutorial on the technique you used in the 2nd card! I just LOVE that fish card that you created for the ATU challenge! HOW DID I MISS THAT the FIRST TIME? AHHHHH! Super fun! Now I can't decide which card is my fav:: turtle or fish....LOVE them both:) You are amazing! THANKS for playing along with us at ATU!! You rock!! Love your cards. Super cute! Just love CPS for inspiration. You been busy girl! Love your cards! I thought you said your cards weren't very good? Where you taking something last night? Because those are both great! I really love the one for CPS - and that sketch totally stumped me! Love the dots with the fish...perfect! very sweet cards, ashley! thanks for playing!